The Severan Tondo or Berlin Tondo from circa AD 200, is one of the few preserved examples of panel painting from Classical Antiquity. 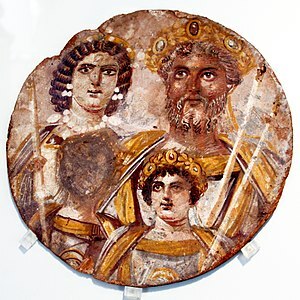 It depicts the Roman Emperor Septimius Severus with his family: to the left is his wife Julia Domna, and in front of them are their sons Geta (with face erased) and Caracalla. It is now part of the Antikensammlung Berlin (inventory number 31329), currently held in the Altes Museum. It is a tempera or egg-based painting on a circular wooden panel or tondo with a diameter of 30.5 centimetres (12.0 in). It depicts the Imperial family wearing sumptuous ceremonial garments. Septimius Severus and his sons are also holding sceptres and wearing gold wreaths decorated with precious stones. This image of a grey-haired Severus, with his wife and young children, emphasises the dynastic ambitions of the new emperor. The darker skin tone of the Emperor reflects his origins in Libya. Julian Domna has her distinctive hairstyle, crimped into parallel locks, possibly a style from her home in Syria, and perhaps a wig. One son's face has been obliterated in a deliberate act of iconoclasm, and the vacant space smeared with excrement. Most scholars believe it is Geta whose face has been removed, probably after his murder by his brother Caracalla and the ensuing damnatio memoriae. However, it is also possible that Geta (as the younger son) is the smaller boy, and it is Caracalla's face which was eradicated, perhaps as a compensatory retaliation for Caracalla's mass execution of young Alexandrian men in the year 215. The tondo was probably created in a square or rectangular shape, and later cut into a circle. The loss of some of the original painting is most apparent with the sceptres that the males are holding: the upper parts, once adorned with imperial symbols, are now missing. It seems likely that the panel was cut down in modern times to improve its saleability on the art market. Another example of dynastic portraits on an aureus of Septimius Severus, minted in 202. The reverse feature the portraits of Geta (right), Julia Domna (centre), and Caracalla (left). The image is probably an example of imperial portraits that were mass-produced to be displayed in offices and public buildings throughout the Roman Empire: as part of Roman legal procedure some documents had normally to be signed in front of an image of the Emperor, which gave them the same status as if signed in his actual presence. With each change of emperor, the portrait would have been discarded or replaced. Since wood is an organic material and does not normally survive, the Berlin Tondo remains, so far, the only surviving specimen of this type of painting. The tondo appears to be of Egyptian origin, using similar materials and style to the Fayum mummy portraits. It may have been painted to celebrate the visit of the Septimius Severus to Egypt in AD 199, following his military victories against Parthia the previous year, and before his campaigns in north Africa in AD 203. Caracalla is depicted as a youth, indicating a date before AD 205. The history of the painting after its creation is not known until the Antikensammlung Berlin acquired it in 1932 from an art dealer in Paris. It remains in the collection at the Altes Museum, one of the Berlin State Museums (Staatliche Museen zu Berlin). Antikenmuseum Berlin; Wolf-Dieter Heilmeyer (1988). Die ausgestellten Werke (in German). Berlin: Staatliche Museen Preußischer Kulturbesitz. p. 373. ^ Harold Mattingly, Edward A. Sydenham, The Roman Imperial Coinage, vol. IV, part I, Pertinax to Geta, London, Spink & Son, 1936, p. 115. ^ Quenot, Michael (1991). The Icon: Window on the Kingdom. St Vladimir's Seminary Press. p. 16. ISBN 0-88141-098-5. ^ Hiesinger, Ulrich W. (1969). "Julia Domna: Two Portraits in Bronze". American Journal of Archaeology. Archaeological Institute of America. 73 (1): 39–44. doi:10.2307/503372. ISSN 1939-828X. JSTOR 503372 – via JSTOR. (Registration required (help)). Some idea of the impression such ornaments would have produced may be derived from the painted tondo from Egypt with shows Julia Domna with pearl pendent earrings and a jeweled diadem and necklace.